Career break or Sabbatical is where an individual takes a break from the work life and tries to focus more on personal life. This is considered to be preferable to take such a break because one can decide if that job is really a learning experience and more career-oriented rather than a career destroyer. But sometimes even taking a break from career loses ones importance to get back to the same old job and creates more havoc in life. Discussed below are few pros ans cons of taking a career break. As we have spoken about the concept of a career break, we should also realize that when one wishes to take a career break there are always some advantages as well as disadvantages which can benefit or help that particular individual to a certain extent i.e. 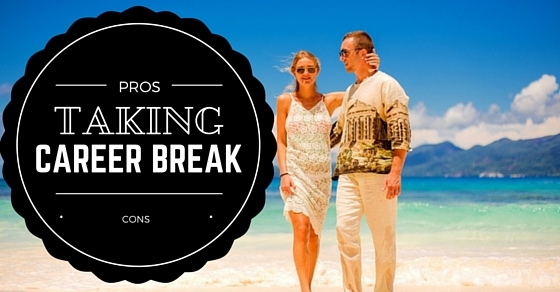 the pros and cons of taking a career break. Firstly let us look at some of the pros of taking a career break which benefits the individual to some extent. At times because of the overloading work that an individual is facing at the work place the relationship with their friends, family and loved and close ones is distanced and keeps him separated from family. So the idea of taking a break or sabbatical from work is an excellent idea to once again start spending time with the family members and spending time with the children and taking interest and active participation in their individual lives. At the workplace the ideas and imagination of the individual is just confined to the workplace and so he doesn’t get time to explore new ideas. But when he takes a sabbatical, new challenges and opportunities come in front of him and will help him learn and practise these new skills in life. The skills which are practised by the individual know that he will benefit from it in the future. With the individual getting time away from the workplace by taking a sabbatical, he gets time to get involved in certain extra curricular activities which he hasn’t been doing in the past. Some of the things that the individual might come across in doing can be by learning a different language, go out for travelling, by doing volunteering work etc. which even cheers up the mood of the person and the individual by helping. At times to get work done before the deadline, people put in long hours of work hence they do not maintain a decent work life and there is no balance in their life at their professional and personal level. So a career break is a brilliant way to get away from the stress and ruining your life. It will help you in relieving all the stress you had in your work place and keeping your energy levels maintained and to be used at the right time which can help improve your efficiency for the future. At a certain level if a person takes a sabbatical from work it may also help the person he is working for. When a person is away from the workplace, the employer has a check on how the team of employees are functioning in the absence of the individual. This helps him in realizing the importance of every individual in the firm in their absence or presence in turn improving the relationship between the employees and the employer. The work environment in which the person is functioning in may or may not be in favour. If certain negativity is going on in the workplace and the person identifies it then for the initial period he looks at taking a sabbatical to move away from all the negative behaviour going on in the work place. This helps to a great extent so as to not letting him get influenced in the ongoing negativity in the work place. At times the individual realizes that the work that is being done is not satisfactory enough and there is no happiness while the work is being done. So certain things the individual is passionate about starts coming in the mind and thoughts regarding finding success in them also comes. So with a help of a sabbatical he starts to explore new better as well as interesting job opportunities and starts to gain knowledge about it and later on may change the career path. When the person is working in the work place since a long time, he knows that he needs to stick to a certain routine or time table as usual every single day. So he forgets the opportunities that wait for him outside the workplace. So after a sabbatical is taken by the individual from the workplace, he starts meeting and interacting with new people thus expanding the knowledge about the different things going on in the world today. Motivation is the most important and essential concept towards building the character within the individual. When the person decides to take a temporary career break from the work place, a sense and feeling of motivation arises. The realization of wanting something more in life along with discovering new things comes within which helps in making him bold and having a sense of determination. When that employee takes a career break there is no one to tell what to do and what not to do. It is a clear break from work life which gives so much freedom that the individual is relaxed and finds the comfort zone to free the mind and soul where he can re-energize himself and then later can get back to the work life with that enthusiastic nature. Every organization wants a enthusiastic nature in an employee so career break is advised from such individual. Now let us look at some of the cons which may cause some negativity in the life of the individual who has recently taken a break from the career. While a person at times thinks of taking a career break to spend more time with family, he also needs to realize that at this time when he sits idle at home his daily schedule like before is empty while his family and friends will normally continue their daily schedules by going to work or school as usual. So if the person doesn’t come up with anything to do in that spare time, the day will not be spent fruitfully and will go to waste. When a person decides to take a sabbatical from the work place for a while, at the initial point he may not realise how costly life is going to turn out in the future. The family would be solely dependent on him at times for the family earnings. So at times if the person is lucky he might still get the salary while he is still on sabbatical but at times he doesn’t receive the pay which increases daily costs and changes the life drastically. When an individual takes a career break from his workplace the progress gained at that moment comes to a standstill. This is usually a problem when the individual was looking forward to getting a promotion in the workplace as well as building the reputation with the number of clients under them. All is not lost at that moment when he takes a sabbatical but everything comes to a temporary halt. When a career break is taken by the individual, the clients are lost under them. Now this can be temporary or permanent in nature. If the work of the client is stopped or comes to a standstill then he loses faith in the individual and moves forward to another person who can do the work given. And slowly as the work is being progressed he attains faith in that person which in turn leads to loss of a client. In certain workplaces the policy of providing a sabbatical to the employees is not approved. So when the individual who wishes to seek a sabbatical from the work place approaches, the boss might not be in complete recommendation in approving it. He may show a negative behaviour as to turning the decision of the person to remove the idea of taking a sabbatical and continue working for now with the firm. When a person returns back to the workplace after the sabbatical it may not always be easy for him to get adjusted to things straight away in the workplace as some changes might have been made in the absence. It is not easy to start the same daily routine which you have been missing all this while in an instant and the possibility of having a lot of difficulties will arise in the work place. For the new job opportunities to attract people to get involved and having it as one of their career objectives large conferences and social programmes are held where the detailed job description is provided to the individuals. But these programs may not always be at a convenient location and travelling expenditures involved would be of a very high cost to the individual who is on sabbatical at the moment as he doesn’t have a proper source of income at the moment. When an individual has taken a sabbatical for a temporary period from the work place they are not physically present in the work place and are not knowing what is being going on or what updates are being done in the work place. So at this moment if they do not keep themselves updated about their job or forget the information about the job they were doing, they tend to lose all the information and knowledge they had about the work which will cause a difficulty to them when they return back to the work place. Recession is the concept when the entire financial market comes to a stand still which affects the related economy which is per capita income of the country. If the income flow is less, the job opportunity also decreases. When a person takes a sabbatical or a career break from the work place there is no future knowledge which is to kept up-to-date regarding the market. When the jobseeker or the individual returns back from the sabbatical, the market trend describes the level of chances of getting new job opportunities. Due to time year gap the employer tries to select the individuals who are always keeping to their work experience because it will not give them more responsibilities of training more people which consumes more time and efforts. So the employer always looks for an individual who doesn’t have any time year gap in the CV recorded. So prepare a resume accordingly as the resume matters a lot and it’s the important factor in recruitment of the job so a career gap will not lay a good impression on the employer who is hiring a employee for the organization. Career break is a necessity but it also comes with disadvantages which can give a great impact in professional life negatively or positively. It’s always suggested to put a lot of thought into taking a break because it can give a long term downfall in career life. If the job is not giving any satisfaction, a career break is an advantage for such people. And for people on the other hand who are just taking break because of the stress and pressure, it is advisable to take a vacation rather than quitting a job which will create a disaster later on.